The emperor Claudius sent four legions and other troops called auxiliaries, to conquer Britain in 43AD. One of the legions the 9th, or ‘IX Hispana’ advanced north and built forts as they went. 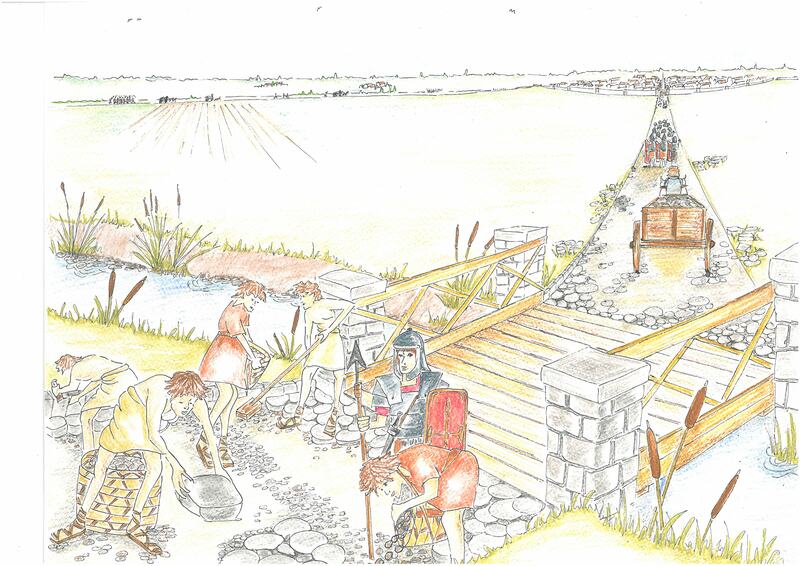 – they built a fort to guard the river crossing at Longthorpe but later changed the line of the road and crossed the river to the south of Castor near Water Newton . They built a smaller fort here to guard a wooden bridge where the main road called Ermine street crossed the river. A small town grew up near the fort because the soldiers and the travellers along the road needed supplies and had money to spend. This later became ‘Durobrivae’ and had a wall built around the town. We know where these forts were because of crop –markings that show where the line of the walls and ditches were. Inside each fort there would have been barrack-blocks, workshops and a head-quarters building. A recent archaeological dig showed that the Water Newton fort was not in use for very long. As the south of Britain became more peaceful the legion would have moved north to what became its main base –Eboracum, which is now York. Roman soldiers’ main weapons were their sword (Gladius), their shield (Scutum), their javelin (Pilum). Their armour was made from iron and leather (Lorica segmenta). Their helmets (Galea) were made of metal. They trained every day to make sure they were skilled in using their weapons. Roman legionnaires fought in a line, protecting each other with their large shields and then then stabbing their enemies with their short ,sharp swords. This is a testudo (Latin for tortoise). The soldiers protected themselves in this way from spears and rocks when they marched up to an enemy fort or gateway. If someone ever tells you a Gladiator is the same as a soldier then they are wrong. Gladiators were especially trained and forced to fight in the arena to entertain people. Soldiers had a choice to serve in the legions, unless your father was a soldier then you had to. Once they had served them for 25 years (assuming you were still alive) they you could retire or live a peaceful life and become a small farmer ,shop-keeper or craftsman. Soldiers could march 20 miles or 30 km a day. They had to carry tools and their cooking pots as well as their weapons. Every night they would stop at a fort, or if they were near an enemy they would build their own camp using turf. Hi I am Maximus, I am 19 years old and I am a Roman solder. I got captured by the Romans in Greece last year and they put me in the army because they thought I was strong but they were wrong, I was a kind lad. I have a mother that has been traded by the Romans to be one of the Emperor’s slaves, a little sister that has been traded for a few pieces of silver. I think of them every day. Once I saw a Roman soldier without his belt on, and as his belt is a sign to say you are a Roman solder , that means he was naughty and everyone could see he had done something bad. The training is hard but I am getting better at throwing my pilum and using my gladius. In the evening we have our meal, drink some wine and then play with dice. I am also learning how to put up buildings, so I may become a builder when I retire, if I ever get to that age!